PLEASE Turn These Social Media Logos into Scary Sea Animals! This is a REALLY fun opportunity for both new and experienced designers. We need you to turn the most popular social media logos, such as Facebook and Apple into mean, hungry sea creatures for our animated video. In this particular scene, on the left there is a mother Octopus preventing the young Octopus from swimming over by the scary underwater sea animals on the right. 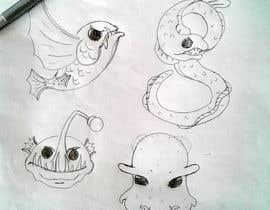 It requires a fair amount of creativity because we need each sea creature to look both like the scary animal AND enough like the original logo. For example, (probably the easiest one is) Snapchat where the illustrator could turn this into a vicious jellyfish. However, the new image still needs to resemble the Snapchat logo so the viewer can understand it's a parody of the original logo. We hope you'll agree this is a cool project that will yield powerful images great for all artists' portfolios. We really want everyone to have fun with this one. The chosen designs will be used not only for the video - but possibly in other promotional media such as websites and our mobile app product. And with other contests we run, the winning entrant will have more design work coming afterwards. I've attached the original black and white logos - message us any questions, thanks for your efforts ahead of time and GOOD LUCK! Thank you too for the fun opportunity! Even though I didn't get picked, I'd still make a clean version of my drawings to include in my portfolio :D Boosted my creativity! Please check my entries . #16 , #17, I hop you will like all and feedback me Thank .